TOPSHAM — A potential rezoning of property owned by Crooker Construction won’t be happening anytime soon. That was the message delivered when selectmen and Planning Board members met Thursday. 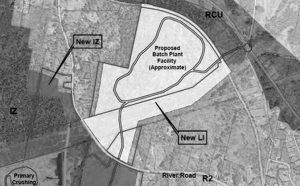 Though it has yet to submit an official proposal, the company has made public its hope to have property between River Road and Route 196 rezoned — from residential to light industrial — so it can move its batch plant to that location. Planning Board member Peter Richard said a rezoning decision would be based on town codes and regulations. “There’s aspects of this that even if we wanted to, we couldn’t consider because we don’t have the mechanism within the code to consider that when doing our assessment for a proposal,” he said. Selectmen would have more authority to tackle broader issues and concerns, including those voiced by residents wary of additional noise and traffic. Another workshop is on the Planning Board’s agenda for Aug. 7.